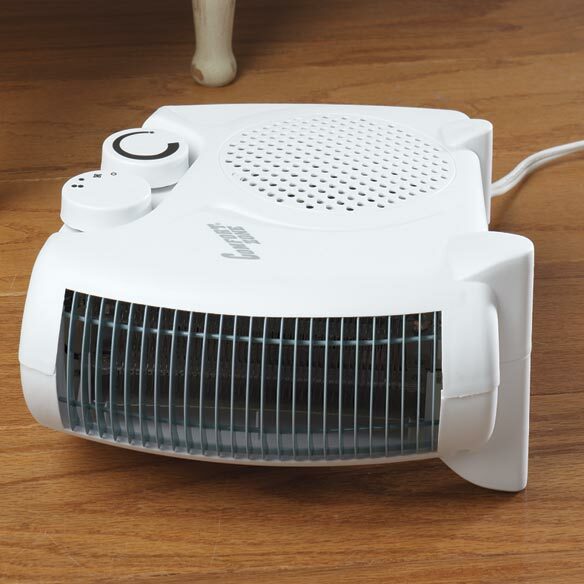 This deluxe two way heater and fan combo offers versatile comfort to fit your space, all year long! 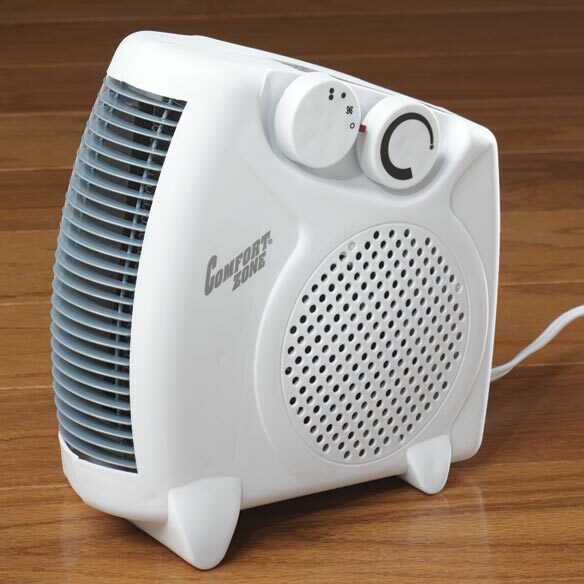 Heater and fan combo features an adjustable thermostat, on/off indicator light, metal safety grille, 3 settings (fan for all seasons, high heat and low heat), safety overheat protection system, stay-cool body with molded handle and 6-ft. cord. ETL listed for indoor use. 10" L x 4 3/4" W x 9 1/2" H.
Bought this one year ago. I mainly use it in a large bathroom in the fall before we turn the heat on or anytime I need a blast of temporary heat. It works very well, is lightweight, and points the heat down low near the floor where it's usually needed. Of course it can be put on a counter top if you want heat on your upper body like when you come out of a shower. I have also used the fan setting in the same room in the summertime. Convenient handle and it's very stable upright or it can safely lie on its side low to the floor. Good product worth the price. Looks nice and works great! this product have great feacher. just the right size for my small bathroom i love it just what i have been looking fore. My office is the coldest in the entire building and this does a great job of heating it up. put close to me because gives the best heat on low.nice medium sounding fan,but not to loud. I use this little heater in my bedroom it helps warm up the room. My 2 little dogs love it. They lay close to it. We don't like the cold. FOR SUCH A SMALL MACHINE IT PUTS OUT THE A GOOD AMOUNT OF HEAT. IT'S PERFECT FOR THE SMALL ROOM WHERE I NEED IT. These fans are wonderful. Three of these little guys heat my whole 16 x70 2 bedroom mobile home on low hest setting. I am very impressed. I bought this product once-love it. I use this heater at work almost every day. I love how powerful it is. My desk is near a door that's open and closed constantly. I had one before and it just stopped working after 1.5 years. I think it should have lasted longer but then again it's used almost everyday in the winter months. I was very happy with the results I had to get another. Finally a unit, that heats the FLOOR/my feet, not the CEILING! I haven't had it long enough to know of the efficiency in electricity, but I definitely recommend this item. Since it has been getting warm here, lately, I have been using only the fan at the present time. This little fan really keeps you warm. Wish it had two speeds for keeping you cool,however it only has one. The heat has two speeds and works very well keeping you warm. The cool fan works ok If you sit right by it. My husband needed a small fan/heater for work & it's actually not easy to find that combination. This is slim, can be used upright or sideways, it's a heater, it's a cool fan & it's nice looking too. My husband was happy that he only needs this for summer & winter...it's a win win! Excellent both heat & fan!! While it worked it worked great! A month later it stopped working!! Called customer service and they took care of it. Customer service gets 5 stars!! I would not buy mthis product again. Returned item as it didn't work in the location I needed it. I need more heat in my bathroom, I like to get my bathroom warm before showering. This should be just what we need for our bathrooms. I needed a new space heater. Hopefully this will do the job!! I need a small fan and heater for my bedroom. The reviews and the price seem like a great deal. I needed a heater and this one looks like I CAN USE IT ANYWHERE. I purchased this for a friend who is traveling long-term in a van! My mother wants it as she lives in ALF. It is compact turns on its side for more space saving. Looks great. Get cold feet at computer. I am going to use it in my bathroom.It is a cool room and I am an old lady. I needed a very small heater to fit on counter of the sink. HAD ONE BEFORE AND LIKED IT. Perfect size for my daughter's small half bathroom. Fits anywhere. Love the fact that you can use it standing up or on it's side. I like what it could do, heat and air conditioner. How many watts is the heater? BEST ANSWER: Thank you for your question. There are three settings. High: 1500 watts, Low: 750 watts and then fan only. We hope this information will be of help to you. Is this suitable for the bathroom? I understand only certain heaters should be used in b'room, due to moisture. BEST ANSWER: Thank you for your question. We would not recommend using this in a bathroom. We hope this information will be of help to you.